A surface is said to be algebraic when it has a polynomial Cartesian equation with real coefficients. The degree (or sometimes the order) of an algebraic surface with equation is the degree of the polynomial P, that we assume to be squarefree. Therefore, it also is the number of intersection points, counted with multiplicity, between the surface and any line, in the complex projective space (and, in practice, the maximum number of intersection points between the surface with a line in the real affine space is a lower bound for the degree and is in fact the degree very often). The notion of degree is a projective notion: all homographies map an algebraic surface onto another algebraic surface of the same degree. The surface is said to be decomposable if it is the reunion of algebraic surfaces of smaller degree and indecomposable otherwise, that is, when the polynomial P is irreducible in . The surfaces of degree 1 are the planes, those of degree 2 are the quadrics, those of degree 3 are the cubic surfaces, those of degree 4 are the quartic surfaces. Examples of algebraic surfaces of degree 6, or sextics: the Goursat dodecahedric surfaces, including the Barth sextic, the sine surface, and the sinusoidal torus. 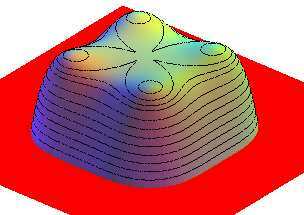 Example of an algebraic surface of degree 8: the oloid. 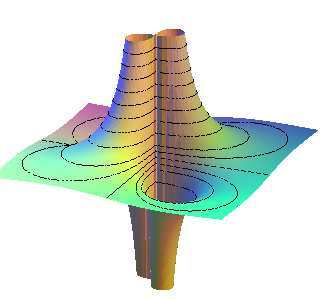 Example of an algebraic surface of degree 9: the Enneper surface. All rational surfaces are algebraic, but the converse is false. A nice quintic surface, , for which the horizontal sections are the lemniscates of Bernoulli. The sextic for which the contour line with value 0 is a quadrifolium.